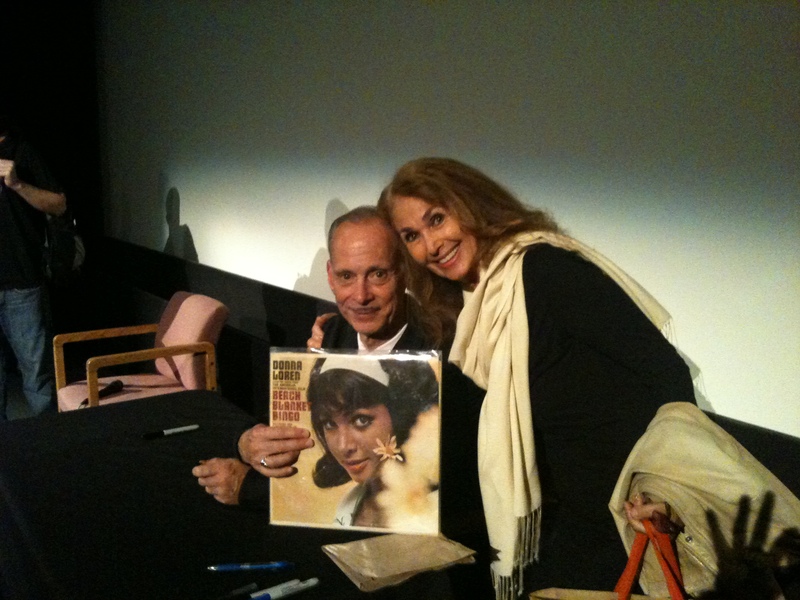 Here's the man… John Waters himself, the Hairspray king. No, he doesn't use any. You can tell I was up close and personal and there wasn't any evidence. Just a kind and generous man. I was standing in a very long line at his book signing recently; only a 20-minute wait for me. When I got to the head of the line, Grant, the manager of the event at the Aero Theater in Santa Monica, announced that Mr. Waters could receive no gifts. My heart skipped a beat as I proudly held my Beach Blanket Bingo album along with the CD re–issue. I mounted the stage and decided to show Mr. Waters the album and ask him reverently "does this have any resemblance to your Hairspray Broadway image?" He gazed at the cover and gave me a "hmmm". He then reiterated that while on his book tour he couldn't receive any gifts, but gave me his address to send it to. At this book signing, the Aero showed two of his films, Female Trouble and Serial Mom. My husband and I walked in at the last five minutes of Female Trouble starring Devine with a close-up of Divine being walked down the hall of a maximum-security prison to his execution by electrocution. In true John Waters fashion, Divine's dialog cried out with lust and laughter (paraphrased), "I've been waiting for this day; tomorrow I'll be on the front page!" Then, after my brief encounter with John Waters, I looked at the long line of his eager fans awaiting their moment with him and decided not to stay for the second feature as it probably wouldn't start for at least another hour. I've had an affinity for Mr. Water's work, beginning with Hairspray; a result of my own parallel experiences with the subjects he's dealt with so poignantly. Long live the King of Baltimore. This entry was posted in Appearances, My Thoughts. Bookmark the permalink. A great reminder of some pretty interesting movies. I can think of a few folks that should see hairspray. Awesome you got to meet John Waters. Super awesome he got to meet you. Oh Donna ! All I see is you !! Can’t stop the music I hear singing inside my heart !! !